For many novice tea drinkers, the selection of tea varieties can be overwhelming. While green tea seems to be the go-to, as we know it has numerous health benefits and is even considered a super-food by many, there are other superior teas worth looking into. One of them is the South African tea known as rooibos, or red bush tea. 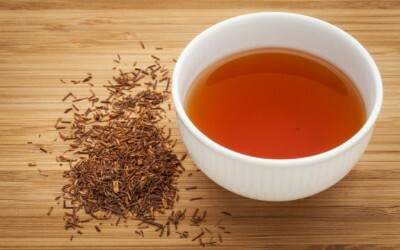 Rooibos tea originated in South African and has only recently begun gaining popularity in other world regions. But this doesn’t mean the tea is new, hardly, as it’s been cultivated in Africa for centuries. Research into the health benefits of rooibos tea, which started in the early 1900s, only increased its popularity both in its homeland and abroad. 1. Rooibos is a great source of cancer-protective antioxidants – Antioxidants protect the cells from oxidative stress and damage. Rooibus has a multitude of antioxidants including two different polyphenols, known as aspalathin and nothofagin. Interestingly, these polyphenols are relatively rare with the first only found in rooibos and the latter only found in rooibos and New Zealand red beech. It’s these antioxidants that give the tea its cancer protective abilities, leading it to be a “leading source of natural anti-cancer chemicals” according to the Cancer Association of South Africa. 2. Cardiovascular benefits – Another healthful component in rooibos tea is a flavonoid known as chrysoeriol. This compound helps the cardiovascular system in several ways, namely by promoting healthy circulation, fighting inflammation, and inhibiting enzymes that can contribute to cardiovascular disease. It may also work to reduce cholesterol and improve blood pressure. 3. Beneficial mineral content – Also fueling the health benefits of rooibos tea are numerous important minerals. It has manganese and calcium, both of which are good for the bones and the teeth. Zinc is included for a healthy metabolism and iron for vascular health. It’s a good source of magnesium too, which is important for a healthy nervous system. 4. Good for an upset stomach – Like ginger tea, rooibos tea is a great solution for upset stomach. It calms the stomach with the benefits of quercetin, an anti-inflammatory known for its own long list of health benefits. Lastly, it’s worth noting that the health benefits of rooibos tea are accompanied by no caffeine. As a matter of fact, it’s even seen as a solution for insomnia. Safe for nearly everyone, rooibos is definitely a tea you want to add to your healing arsenal. Rooibos can only be grown in a very specific place in Africa. This specific place is home to thousands of rare species that also can only live in this same place. In just the past few years, the large-scale farming of rooibos in this vulnerable environment has caused the extinction of hundreds of species. Engaging in the consumption of rooibos is exploitative both to the environment and to the people who have lived there for thousands of years and who are being kicked off of their ancestral lands so that farms can be established there. There are many foods and teas that are just as beneficial to your health but don’t cost the Earth so much. DON’T DRINK ROOIBOS TEA. It smells like tobacco to me. My grandma uses smokeless tobacco, and this smells like it. While I like the benefits, I can’t get over the smell. This is great news, I absolutely LOVE rooibus! I drink it hot or cold, always use it as a base and just add a little of this or that (usually cinnamon & marjoram, but sometimes mint or ginger) to adjust the flavor. It’s also one of the more economical teas to buy, I get mine in bulk and always organic for less than $10 a pound (and a pound will last me over a month). I make mine in a coffee pot with a natural filter, and can run the same brew up to three times. It has a true tea flavor (kind of reminds me of nestea, but I wouldn’t touch that crap anymore) and a pretty reddish color. I’m not a fan of green or black tea, so rooibus makes me a tea drinker. Where do you purchase it for less than $10 a lb? Can we buy it online?